Four Tumbling gymnasts from Milton Keynes Gymnastics travelled as part of Team GB to St Petersburg, Russia this week to compete in the 26th World Age Group Championships for Tumbling & Trampoline. The event hosted by the Russian Federation was an absolute spectacle, with over 46 countries taking part over the course of the week across three disciplines of gymnastics. The biggest category of the week was indeed the Tumbling 15-16 boys with some serious competitors set to fight amongst each other for who would be the 2018 World Champion. Over three subdivisions and some very tough competition Jack Leahy put up some very strong tumbling passes to secured his place into the final with a score of 69.400 sitting him in 2nd place just 0.200 behind Americas Grant Reed Forsee. Jack was also accompanied by his GBR teammates Marcus Adams, and 2017 World Champion William Cowen, as the top eight boys from the age group headed into the final later that evening. This final was not to be missed! With the line-up consisting of USA, Great Britain, France and Russia everyone was representing red white and blue. As the stands filled and the delegations from all countries began their chants and songs in support of their athletes, the arena came alive. Jack knew that this would be a fight for the title and he was under no illusion he would need to go all or nothing. Prior to warm up Jack and his coach Mikey French had a conversation that would require Jack to put out a new routine for the final with a difficulty of 8.9. This would be the highest difficulty of the group and also the highest difficulty Jack has performed this year, it’s safe to say the pressure was on. After six athletes had performed their final routine Russia’s Aleksei Svetlishnikov was in first place with a fantastic double twisting double tuck transition to a triple back somersault and a score of 35.800. Jack Leahy was up next to take the stage one more time, with Team GB chanting and showing their support for Jack he was stood on the run up ready to perform the routine of his career to date. Jack presented to the judges and began to charge down the run up into a monster tumble! a double twisting double straight transition through to a triple twisting double tuck, landing cleanly on his feet and a personal best score of 36.600 sent jack thundering into the 1st place position. With only one more competitor remaining from the USA everyone was watching nervously anticipating the outcome of a tremendous final. As the score came up for the final routine of the night at 35.900 a huge roar was let out by all of Team GB, Jack Leahy had done it! he was the new15 – 16 World Champion and sent Great Britain into the history books as this was the only title GB had yet to win in the age groups. This was Jacks forth World Championships, missing out on the gold at three of the four 2014 = 8th, 2015 = 2nd 2017 = 2nd but not this year. Jack has worked extremely hard with his coach, pushing through injuries and setbacks to final achieve what they set out to do. Jake Parry was next up in the 13 – 14 Boys category. This was jakes first World Championships and at the younger age of his group he had a lot to prove against some strong competition. Jake has worked extremely hard over the years narrowly missing out on a few opportunities so this was his time to enjoy what he had worked for and rightly deserved. After a tough competition putting out some fantastic routines Jake finished the competition with a score of 61.800 in 14th place, as only the top 8 can advance to the final this meant that Jakes competition had come to an end there. Jake is able to take a lot away from this competition and now knows what he needs to work on and where he needs to make gains going forward to 2019 with his sights set on Tokyo, Japan for the next world age. 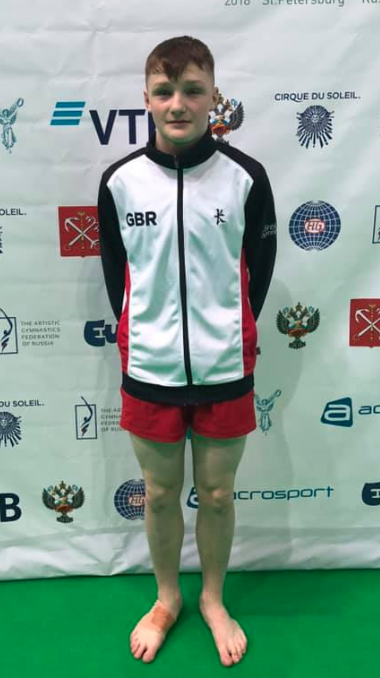 After a fantastic year competing internationally and domestically everyone at Milton Keynes Gymnastics is extremely proud of Jake and his commitment and achievements. Freddy Liggins was the youngest competitor from Milton Keynes Gymnastics in the Great Britain team. At just 11 years old this was also Freddy’s very first World Championships, to be so young and so far away from home this was surly going to be a big test for him. Freddy is a fantastic competitor and has a great personality to match along with his GBR teammates he rose to the occasion. After a very strong round of qualification events, Freddy scored a whopping 61.000 landing him in 4th place and a sure spot in the final amongst the top 8 in the world. Knowing he had a big task ahead of him that evening Freddy got himself focused and ready to put out one more routine in the final to fight for that number one spot. Thundering down the tumble track adrenaline fuelled, Freddy jumped higher than he ever has into a double pike back somersault and slightly over rotated resulting in a costly fall. With a final score of 28.000 Freddy finished his completion in 7th Place. Naana Oppon was last up in the 11 – 12 girls category, performing some of the hardest routines in the age group Naana was battling it out for the number one spot. Already winning her 4th British Title this year she was a favourite going into the World Championships. After qualifications and some slight issues with landing steps Naana hit a score of 63.200 claiming 2nd place heading into the last final of the competition. Trying to step the bar up even more Naana went all out in the final and unfortunately this didn’t work out fighting out of her transition, Naana took a tumble on her last skill finishing her final competition of the year in 7th Place. This will not stop Naana as she is more determined than ever to gain that one medal still not in the trophy case.